Hello readers and writers! We've got massive news to share with you today... Writer's Edit has launched a new fantasy fiction imprint: Talem Press! 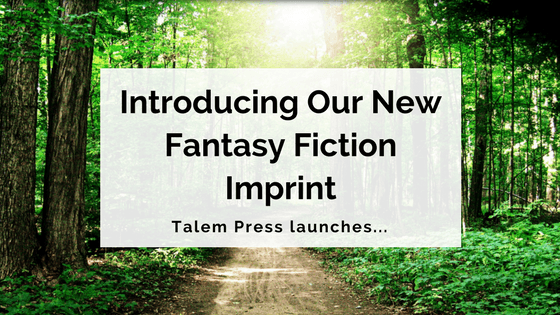 Talem Press is a new publisher of fantasy books, and is an imprint of Writer’s Edit Press. Founded in February 2017, they're a completely independent, Sydney-based house. Talem is the latin word for ’empower’, which is exactly what their books and authors aim to do. They believe in the life-changing potential of stories, and everything they publish seeks to provide inspiration and escape. The folk at Talem are particularly passionate about unlikely heroines, mysterious magic and out-of-this-world story-telling. Talem Press will be publishing our very own Founding Editor, Helen Scheuerer's debut fantasy novel Heart of Mist later this year. Heart of Mist is the gripping first book in The Oremere Chronicles, a fantasy trilogy of epic proportions. In a realm where toxic mist sweeps the lands and magic is forbidden, all Bleak wants is a cure for her power." Helen is a YA fantasy author from Sydney, Australia. Heart of Mist is the first book in her high fantasy trilogy, The Oremere Chronicles. It explores themes of identity, belonging, loyalty, addiction, loss, and responsibility. Helen is currently accepting review and interview queries, and has a media kit available upon request. Get in touch with her here. For any questions regarding Talem Press, leave a comment below, or contact us here. Writer’s Edit is a young online literary magazine created especially for writers and lovers of books. Founded in July 2013, the magazine is home to writing and book-related news, as well as advice and inspiration for emerging authors. Writer's Edit also publishes the anthology Kindling. To find out more, click here.